Happy National Chocolate Candy Day! Take a deep breath, bacon fanatics. This just happened. 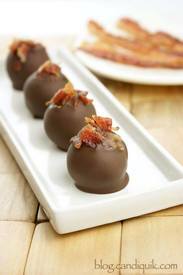 Diced bacon atop chocolate peanut butter truffles. And it happened very well. Trust me on this one. There were a couple special ingredients that I believe made these truffles extra awesome. -Bacon. Duh. The whole salty+sweet combo – you with me? -Chocolate Peanut Butter. Heaven by the spoonful.